Alex was born and raised in Wooster, Ohio and attended Wayne Presbyterian Church in Muskingum Valley Presbytery. After graduating from Wooster High School, he attended Messiah College and earned a bachelor's degree in biblical studies, German language and minor in church music. He then entered Louisville Presbyterian Theological Seminary, where he earned hi Master of Divinity degree. Upon graduating, he served as pastor of Henryville Community Presbyterian Church and Mount Lebanon Presbyterian Church in Henryville, Indiana. He also served as pastoral support for the Sweaty Sheep new church development in Louisville and as staff for Churches Uniting in Christ. Since 2014 has been the pastor of Langcliffe Presbyterian Church in Avoca, PA, near Scranton. 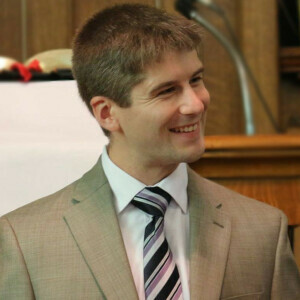 In addition to his service at the congregational level, Alex has also been active in Presbytery, Synod, and national service. He has served as the President of Trustees and the chair of the Congregational Innovation Team in Lackawanna Presbytery, on a new pastor advisory board for the Synod of Trinity, and as a General Assembly Commissioner for the PC (USA)'s 2016 General Assembly in Portland, OR. In his training, Alex has received his Clinical Pastoral Education training (CPE). Alex met his wife, Corinna Becker (of Ephrata,PA), while in college, and they were married in 2009. They have three cats, two dogs, and one rabbit, who all bring a lot of joy into their lives. When they're not at work, Alex and Corinna love spending time with their two nephews in Atglen, PA , with more on the way!